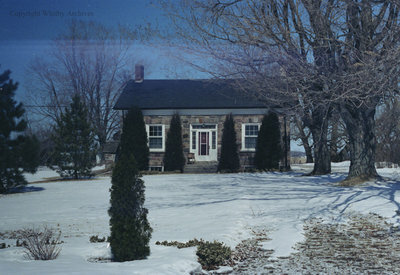 A colour negative of a fieldstone house in Orono, Ontario. This house was the inspiration behind the fieldstone farmhouse in the Miniature Village at Cullen Gardens. View is of the front of the house. Stone Farmhouse, Date Unknown, Photographer Unknown. Whitby Archives A2013_042_235C.